Cherrapeno: Ooh la la - Macarons! Ooh la la - Macarons! I am so behind the times! I should be making no-knead bread at the moment - it seems to be the latest craze among food bloggers. Instead, I'm making my first macarons, which were pretty hot last year. After seeing these irresistible chocolate macarons from Ms. Adventures in Italy, I came clean, admitted I was a macaron virgin and set out to do something about it. The first recipe I tried came out quite well, but the macaron batter was just a little too runny and they didn't puff up as much as I would have liked. So, I looked though as many recipes as I could lay my hands on, even bought a French macaron cookbook whilst in France last week, to help me in my quest. Luckily, my search was fruitful, mainly because other food bloggers have tried and tested many recipes, which led me to this one by Robyn at Serious Eats. It worked well because the measurement of egg whites came in weight, rather than volume, making it far more accurate. There were also many other hints and tips for making macarons in Robyn's post. I followed the recipe closely, adding some powdered coffee to the almonds and used a Silpat sheet to pipe the mixture onto. The results were pretty good, a crisp macaron with a soft centre, filled with some Nutella cream - my latest favourite filling. Mix the ground almonds, icing sugar and powdered coffee in a bowl and put to one side. In a large clean, dry bowl, whip the egg whites with a pinch of salt until they become foamy and stiff. Gradually add the granulated sugar, whisking well after each addition, until the mixture is stiff and shiny. Gently fold in the almond mixture, using a large spoon or spatula, until incorporated. The mixture should be shiny and firm, but with a bit of 'flow' to it. Don't over-mix it or it will be too runny. Fill a piping bag with a 1cm round tip and pipe the mixture onto Silpat or baking parchment. Tap the sheets gently to remove air bubbles and let dry at room temperature for about an hour or so before baking. Bake in a preheated oven, 160º/325F for about 12-15 minutes, depending on the size of them. Use a wooden spoon to keep the door ajar slightly, and rotate the baking sheets after 5 minutes for more even baking. Whip the cream to soft peaks and gently fold or whip in the Nutella. Pipe or spoon onto half the macarons and top with the other half before serving. I confess that I didn't even know what a macaroon was until recently. I have never eaten one and certainly never made them. I really should change that soon! Good for you for making these, they sound good! These look gorgeous - so perfect! I haven't gotten around to macaroons yet either....one day! Beautiful Nic, you should be very proud of these. Two things I'm not fond of doing is creaming butter and sugar and mixing egg whites. Your instructions make it sound so easy. Who cares if you're behind the times, when your Macarons look this good! Very well done Nic! I am impressed. By the way I gave you an award on my Oak Cottage site. Well deserved too, I might add. They look delciious and I've yet to try a macaroon too! These look reaaly tasty and I like the idea of the nutella filling. I have just rediscoverd nutella, after a few blogs fesatured it in recipes. Does the silpat sheet make a difference? They look delicious and I love anything with Nutella. Great post! Your Macarons look so gorgeous and with Nutella just perfect!! Glad my post inspired you to experiment!! They look great! I'd be curious to see if you tried a batch without propping the oven door open. Nicisme, your macarons are so beautiful! I would have never guessed it was your first time! A few days ago I've decided to try making them too, and I've also marked the Serious Eats recipe as the one I'm gonna use. I'm happy to see you liked it. Those are your first macarons? Wow, they look great! I've never had one but I've seen so many in blogs everywhere, I really have to buy a kitchen scale and try my hand at that recipe! Wow! I'm impressed. Your macarons look beautiful. I would have never guessed that they were your first. That is one thing I haven't ever made. I love them, but they intimidate me! Gretchen - I hadn't had them for years, my mum used to make them when I was small and I didn't like them! Alfie - I keep saying 'one day' when I see all the recipes on food blogs!! Pam - thanks so much, I am a bit nervous with egg whites myself, and eggs are so expensive here - you can't afford to mess up too many times! Marie - thanks for the award, I'll pop over to your blog! Pixie - If you like meringue and almonds, I expect you will like these. 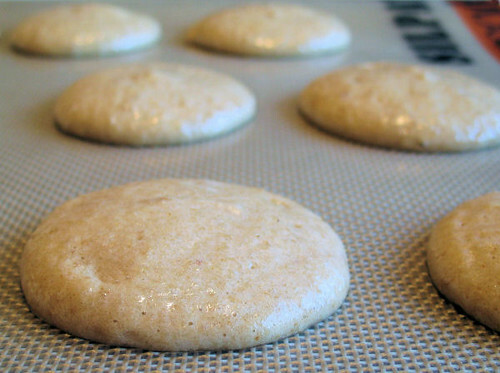 Holler - YES, silpat is the best thing for meringues, it just peels off. I didn't like it at first, but now I use it quite often. Christime - welcome! I love Nutella too. Rosie - thanks - I think I have a Nutella craving at the moment! Sara - yep - I'm going to blame it on you, lol! I'm not sure that I did try it without leaving the door ajar, drat! I'll have to make some more to experiment!! Jeena - I'll pop over for sure, thanks for the invite! Miri - I'll look forward to seeing how yours come out - we'll have to compare notes! Priscilla - oh thanks so much! LyB - you HAVE to get some kitchen scales, I would be so lost without mine - you wouldn't survive in the kitchen over here without them! StickyGooeyCreamyChewy - thank you so much. 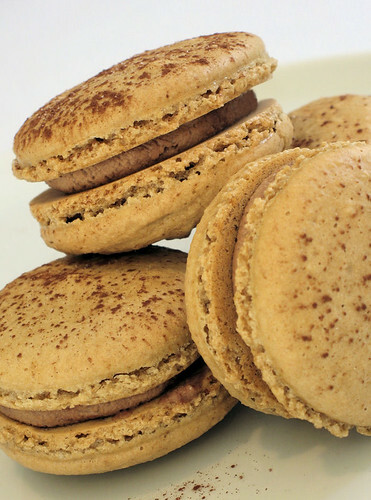 I wonder why macarons have so many of us quaking in our boots, they really aren't that scary!! Patricia - I would send them, but I know that making these would be a doddle for you, you are such a great cook! this looks like a winner! I tried your cappucino muffins...fantastic! will post on it soon. Nic, I'm sat here drooling all over my keyboard. Your macarons look absolutely fantastic. congratulation s... u are no more a macaroon virgin !!! after seeing these,no one can say this was your first time. They look so perfect. I think now i am officially the only food blogger who hasn't tried to make these. Oh la la! Looks really good. I never attempted to make macarons before. Pictures are great. PS: I signed up for Taste & Tell and haven't heard from her yet. I'm pleased you have given us a recipe that works. I too have tried macarons but they never seem to have turned out perfectly. These look perfect and very cute! M&Ms - thanks for letting me know that you liked the muffins, that makes me v. happy! Sylvie - thanks - but don't drool into the keyboard! Kate - you had better get into that kitchen now and make some, it's not much fun being a macaroon virgin! Helene - thanks so much. Glad you signed up, you should hear by the 11th March I think. Margaret - I hope this recipe works for you too, and thanks! Haven't had macaroons in ages, and your photos and recipe search are inspiring. Love your close-ups! I feel like I can pick one up off the page. I love the flavoring of coffee and nutella, sounds perfect. Hi Manju - thanks so much for the nice comments! Julie - oh yeah, coffee and Nutella is the best! aforkfulofspaghetti - thanks and yes, they were edible for sure! Susan - lol, how true! Margot - thanks and let me know how you get on making them! Oh WOW - those look as good as Pierre Herme! I am also a macaron virgin and keep meaning to change all that. Maybe 2008 is The Year! Beautiful photos too. Now I think I must be brave and try making macarons too. Yeah baby, flaunt those baking skills! Perfection! Thanks Jeanne, Jaden and Cynthia! You've done a great job. These look wonderful. What a great flavor combination! Cenk - thanks so much for visiting and for the super comments! I have macarons on my list to make. I too have never made them , nor tasted them. These look great!